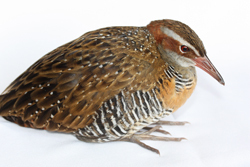 The Buff-banded Rail falls into the waterbird family as it just loves clean water-bodies such as ponds, drainage channels and billabongs in which it can clean and preen its plumage. Their preferred habitat includes dense reeds and vegetation or crops near its water source in which it can hide, nest and breed. Here it makes an unlined cup-shaped nest of grasses or reeds. Both parents incubate the eggs and once hatched the young leave the nest within 24 hours. Both parents then remain with the young, which usually feed themselves, though the female may feed them as well. 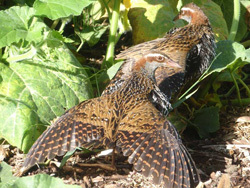 Two broods may be raised in good seasons. The breeding season occurs from September to February when a clutch size of 5 to 8 eggs are incubated over 19 days. That means there are plenty of chicks around at present, learning to contend with their environment. At this time they are extremely vulnerable to predation by dogs and cats. Keep an eye out for them when slashing or mowing too. 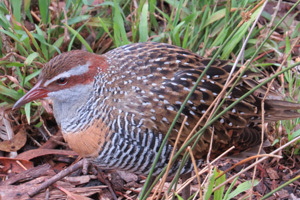 Out of breeding season this Rail is seen singly or in pairs and is secretive but not shy. It is often noticed when darting for cover after it has been disturbed. The young will scurry into cover when adults give an alarm call. 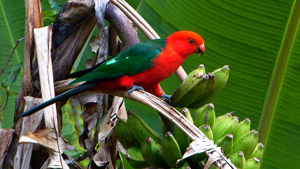 These calls consist of loud creaky squeaks, however when breeding the birds are usually silent. 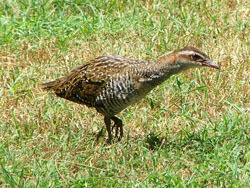 The Buff-banded Rail feeds on crustaceans, molluscs, insects, seeds, fruit, frogs, carrion and refuse and mostly feeds early in the morning and the evening. Description: It has a distinctive grey eyebrow and an orange-brown band on its streaked chest. The lores, cheek and hindneck are rich chestnut. The chin and throat are grey, the upperparts streaked brown and the underparts barred black and white. The eye is red. 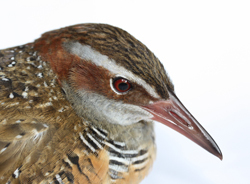 Young birds are much paler to white underneath, with indistinct bars and only a faint orange-brown tint on the chest. 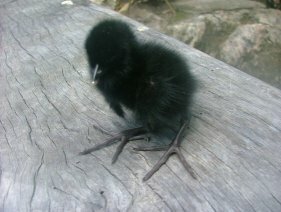 Downy chicks are fluffy black. 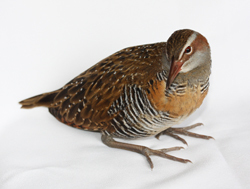 An easy way to identify a Rail is in the way it walks, flicking its short tail constantly. 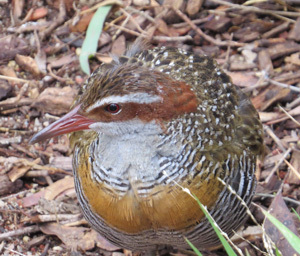 The Buff-banded Rail is secure in its conservation status and is a most welcome visitor to our farms and gardens as a natural pest manager so enjoy watching the antics of this sweet bird.